Hub Schwandt (PHS Class of 1939) spent his entire life in Paynesville except for his service in the U.S. Army during World War II, which included nearly 30 months of captivity, is being recognized as a distinguished alumni this year. Maybe if you had spent nearly 30 months in captivity and still had the image of Old Glory coming to your rescue you would understand how Hub Schwandt felt about the flag. "One of the prettiest sights I ever saw was when the American troops came to free us - the troops came marching in waving the American flag," Schwandt once said. "The American flag has always been a symbol of freedom throughout the world, but it had special meaning for me that day." Hubert "Hub" Schwandt, born and reared in Paynesville, grew up on South Street and also lived there as an adult, before dying at the age of 83 in March 2004. He spent his entire life in Paynesville except for his service in the U.S. Army during World War II (from 1941 to 1945). 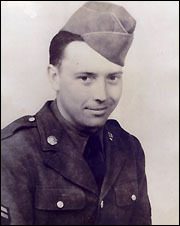 He was drafted into the army two years after graduating from Paynesville High School in 1939. He served in Company C of the First Armored Division of the Sixth Infantry and participated in Operation Torch, the Allied invasion of North Africa in 1942. He was member of a tank crew, which landed in Oran in French Algeria in 1942, under a combined American and British expedition to free North Africa from the Germans. Moving east towards Tunis, they ran into the Germans. "It was hell in Africa because we didn't have the best equipment," he said. "Once we ran into (General) Rommel, we didn't last very long." Taken to Tunis by the Germans, they weren't sure how they would be treated. "When we were first captured, we thought they were going to shoot us," said Schwandt. They didn't, but during the next two and a half years, while the Allied armies were defeating Nazi Germany and Japan, Schwandt was held as a prisoner. His military service is more a tale of epic endurance than heroic accomplishments. He spent 29 months and 27 days as a prisoner of war. During his captivity, he was taken from North Africa to Sicily, then to Italy, and eventually to Germany. In Sicily, he remembered being held in a dungeon for four days without food or water, with the POWs taking turns at night to keep the rats off themselves and their comrades. In Italy, he lost 100 pounds in 56 days, going from 225 pounds to 119 pounds in less than two months. After Italy surrendered in 1943, Hub escaped but was recaptured 25 days later and taken to the stalags (prison camps) in Germany for the rest of the war. "One time," he recalled in 1988, "10 or 12 of our guys hid out in an old incinerator. Nobody would tell where they were hiding, and the Germans were getting tired of our protecting their location. They lined all of us up against the wall. They counted out every 10th man and made him turn toward the wall. If the first man didn't tell where the prisoners were hiding, he would be shot - then they would go to the next 10th man in line - until he told or he was shot. I was one of the 10th men lined up, but, luckily for me, somebody told where our friends were hiding before they got to me, or I wouldn't be standing here today." Among the gruesome sights he witnessed while a prisoner were the executions of Jews. He saw the Germans shoot long lines of Jews and push their bodies into trenches. He spent the most time in Germany at a prison camp near Hammerstein by the Oder River along the border with Poland. Here, in 1944, they received Red Cross packages, put on a little weight again, and even got to play softball. Most days, they would have rutabaga soup with one or two pieces of horse meat and some black bread. "You had a terrible craving for food," Schwandt explained. "You can't imagine. You were hungry all the time." Prisoners would walk around and talk to try to keep from thinking about food, said Schwandt. People here may think they are hungry, he said, but the craving for food drove the half-starved prisoners crazy. At the start, two prisoners would share one Red Cross package, which was a little smaller than a shoebox and full of food. Then three would share a package. Then four. The explanation they got was that air raids always hit the Red Cross packages, which Schwandt found hard to believe. "They never missed," he said. "They were perfect shots (when it came to the Red Cross packages). That's what they told us." By the winter of 1945, the Russians had started their final offensive against the German army, eventually capturing Berlin. Schwandt and other prisoners were moved by the Germans as the Russians advanced. One time during his captivity, the prisoners were served soup with no meat, only maggots that they picked out so they could eat the soup. "You don't realize how bad it is," he said of their hunger and physical condition to be able to do that. "We knew the Germans were getting hard up because they couldn't afford horse meat," he said. While moving east in 1945, their guards left them one night, freeing Schwandt for the second time. But, while trying to head for the American lines with some other freed prisoners, they were recaptured by the Gestapo. Schwandt was finally freed for good in May 1945 by the advancing American forces. As a liberated prisoner of war, Schwandt was sent home on leave immediately (needing only to return to the army for a couple months to obtain his discharge). But an experience like that never really leaves you, though you probably wouldn't have learned about it from talking to Hub. Like a lot of guys coming home from the war, Hub didn't want to talk much about it, said Delores, his wife of nearly 56 years. At that time, help wasn't as available or as accepted as it is now. Soldiers "faded into the population," she said, and "got back into your life." "Through the years, he didn't talk about it much," she explained. His experience, though, was evident in his patriotism. Delores can still remember how upset Hub was at Memorial Day in 1945, because he thought the soldiers weren't being given enough respect and honor. After seeing this Memorial Day service, Hub suggested honoring Gold Star mothers and fathers and dropping the poppies, which are still part of Memorial Day services. "He was very patriotic and loved his country and his flag," said Delores. He passed that along to his family. Memorial Day was always important to him because he wanted to honor all veterans and keep alive the memory of those who never returned home from the war." Even at parades, it burned Hub to see people not respecting the flag, said Delores. "They fought for their country and their flag, and they wanted people to honor it," she said. In 1946, he helped organized the local Veterans of Foreign Wars post. He also started the firing squad, which has served at numerous military funerals and occasions. He served as quartermaster of the firing squad for 35 years. In 1952, he helped to start a drill team - with twirling rifles in precise timing - that represented the town at various parades. 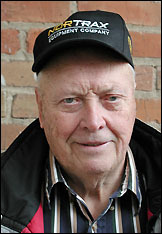 After his discharge, he worked as a mechanic at local Chevrolet dealerships until 1961, when he became a mail carrier. During his 24 years as a mail carrier, Hub was told by people on his route that they "could almost set their clocks by him," according to Delores. He also owned and operated a small sanitation service, including a local landfill, started in the 1970s after the city dump was closed. He played football in high school and played town team baseball after his discharge. He loved cheering Bulldog baseball, football, and wrestling, especially wrestling, for which he was a regular attendee. Even when he retired, he worked repairing lawn mowers and other machinery. "He liked to be busy," said Delores. "He wasn't one to sit around. He wasn't one to sit and mope." He never lost his sense of humor either, she said, loving to tell stories and jokes. Hub and Delores raised six children and have over 25 grandchildren and great-grandchildren. "He lived in Paynesville all his life," said Delores. "He never really wanted to go anywhere else." Maybe 30 months of captivity, in addition to giving a deeper respect for the flag, makes home seem like a pretty good place. "I was lucky," Hub once told the Press. "I was fortunate to get out of it in one piece."